Mary Beth Gadus lost her long, courageous battle with breast cancer at age 63 in August. However, the Carmel resident’s mission of raising research funds to eradicate metastatic breast cancer through her 100 Voices of Hope organization will go on. As October is Breast Cancer Awareness Month, 100 Voices of Hope will hold Comedy for Cures Oct. 12 at Bub’s Burgers, 620 S. Main St., Zionsville. The dinner will be at 6 p.m. with comedian Dave Dugan performing at 8 p.m.
Maxwell has been with the IU School of Medicine since 1989 and in the development position since 1996. Maxwell helped Gadus start 100 Voices of Hope. Maxwell said Mary Beth really believed in research. 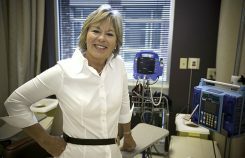 “She gave a face to breast cancer research because she said research was the only thing that was going to extend her life and other women like her,” Maxwell said. Maxwell said 80 percent of breast cancer victims are cured and move on. “But for the 20 percent who have the disease that spreads, it’s a killer,” Maxwell said. Gadus was diagnosed with cancer at age 35. Mike Gadus said it’s important to continue to help his late wife’s organization. Gadus has two sons, Michael, 32 and Matthew, 30.